Welcome to Ontario, that pesky Nipigon River Bridge, Hattie Cove at Pukaskwa, park entrance and White River Suspension Bridge. Upon rejoining society after four days on Isle Royale, it was time to push even farther north. 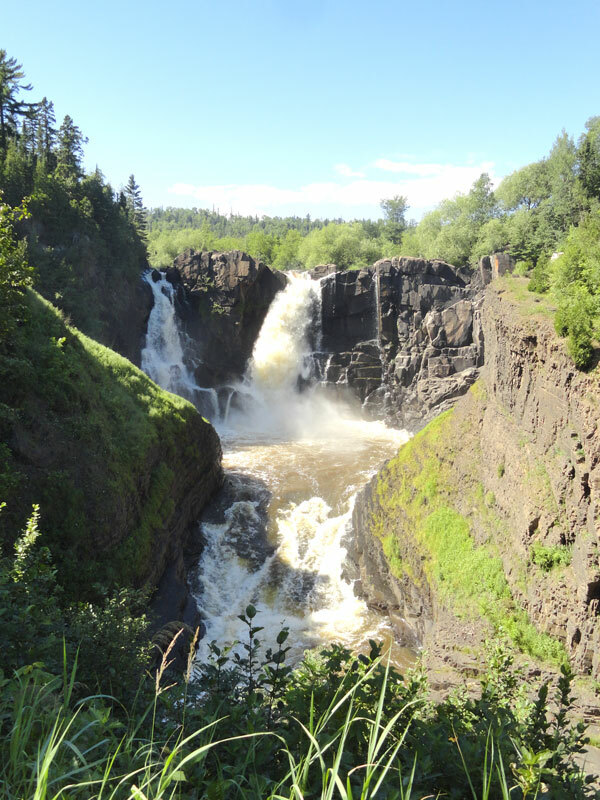 Just a 15 minute drive from the dock we pulled into Grand Portage State Park, right along the Pigeon River that separates the United States and Canada. 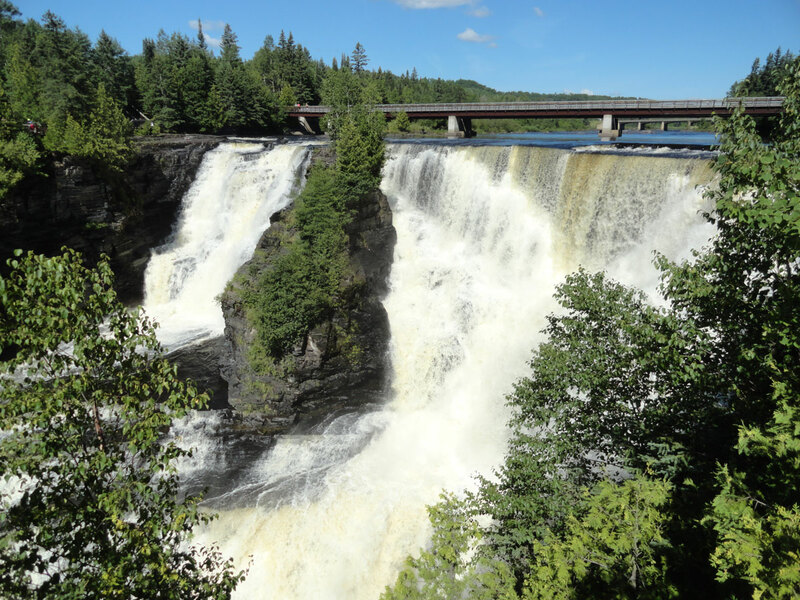 The highlight of the park is the 120-foot tall High Falls, one of the major obstacles the voyageurs were avoiding on the Grand Portage Trail. A half-mile paved trail and boardwalk leads to two viewpoints of the tumbling falls and the Canadian side of the canyon. Back in the car, we crossed the Pigeon River and got our passports ready for the customs agent. He gave us the standard questions about where we were going and how long we’d be in the country, and we were welcomed with typical Canadian friendliness. The only real adjustment we had to make was squinting at the teeny kilometer numbers on our American speedometer. Seriously, why can’t the U.S. just join the modern world and use the Metric system already? The Canadian portion of the journey was planned as a series of brief stops rather than multi-day stays like at Voyageurs and Isle Royale. In retrospect, part of that was due to the difficulty of finding online tourism information about this remote portion of Ontario. We knew of a few spots we wanted to hit ahead of time, but after passing through, we found there are more worthwhile destinations than we realized. The region’s beauty surprised us at every turn and the places we planned to see exceeded our expectations. The north shore of Lake Superior is really an undiscovered and underrated corner of the world. Our pleasant experience was enhanced by the days of consistently perfect weather. Arriving at the peak of the summer season, temperatures were comfortably in the upper 70s and low 80s (F) and skies were nearly cloudless. Locals assured us this is rare, since Lake Superior is so large it creates its own weather systems and can stir up a storm at a moment’s notice. Rugged shoreline of Lake Superior in Ontario. That being said, our first night’s stop was in Thunder Bay, Ontario. From Isle Royale we’d been looking across the lake at the bay’s entrance, so it was cool to be on the other side seeing the island as a sliver on the horizon. Thunder Bay has an interesting recent history, having been formed in a merger of the twin cities of Port Arthur and Fort William in 1970. There remain two distinct “downtown” districts, but it now operates as one municipality. City population is around 110,000, making it the largest in Northwestern Ontario, but only 19th in the province as a whole. (As a reminder of the large size of Canadian provinces compared to our states, Ontario shares a border with most of Minnesota and Upstate New York at the other end, that’s quite a spread) We settled at the Valhalla Inn for the evening, a full-service hotel located near the airport on the edge of town. Since this was about the halfway point of the trip and we’d just spent 4 days on a remote island, it was definitely time to do laundry. Barb’s Laundromat turned up in a Google search and became our base for the next couple hours. There’s no place to hang with the locals and get acquainted with Canadian cash like an old-school laundromat. With everything clean and folded, we decided against venturing out again and dined at the Valhalla’s upscale steakhouse, Runway 25. The restaurant was quiet on the late Thursday evening, but we felt back in our urban element enjoying proper cocktails, wine and steak. Our server Susie was wonderful, sharing stories of coaching women’s hockey, wolf encounters in her neighborhood and driving her car under a moose. It’s almost like she was planted by the visitor bureau to be the most Canadian person possible for our first evening in the country and we ate it up. View of Lake Superior from Terry Fox Memorial and Lookout. Sleeping Giant is at left. We joined the Trans Canada Highway at Thunder Bay and would follow it around Lake Superior for two days. Just outside of town, we pulled off at a roadside monument to Terry Fox, an athlete who set out on a cross-country run to raise money for cancer research in 1980. Unfortunately it was at this point that he had to give up his run, but the memorial plaza and statue overlooking Thunder Bay and Lake Superior speaks to his lasting legacy. From this vantage point there was also a good view of the Sleeping Giant we’d seen on the horizon from Isle Royale. It is part of a large Provincial Park that looks incredible, but will have to be visited on a return trip. Another hour on the highway led us to our next stopping point, a tiny Provincial Park called Ouimet Canyon (pronounced “we met”). This canyon was a surprising find, as we hadn’t been expecting this part of Ontario to be so rugged. A 150m wide, 100m deep gorge has split open in the volcanic-formed rocks. There are a couple theories on how this happened, but the result is a short but dramatic canyon that is deep enough that plants growing at the bottom are normally found 1,000 kilometers farther north. The park only consists of one pathway that leads to two overlooks, but the views down the sheer walls and out over the lumpy terrain are worth stopping for. Continuing northeastward took us through heavily forested land to the northernmost reaches of Lake Superior at Nipigon. There’s a fascinating point here, where one bridge literally links the two sides of Canada. It spans the Nipigon River and is the only way to drive across the country without detouring through the United States. In January 2016, an expansion joint on the brand new replacement bridge buckled unexpectedly and completely severed the Trans Canada Highway for a day and caused delays for a month. Good thing it’s an attractive bridge. We still had two hours of driving to get to our overnight lodging near Marathon at the Pic River Guest Suite. There aren’t a ton of hotel options in this sparsely populated area, so we were happy we booked ahead as always. Food was equally hard to come by in Marathon on that quiet holiday weekend, resulting in our only fast food experience of the trip at A&W. Luckily the LCBO liquor store was open so we could grab some beers, and a grocery store was available for the next day’s food and supplies. The Pic River Guest Suite turned out to be perfect, located in a First Nations community just a few minutes from the entrance to Pukaskwa National Park. 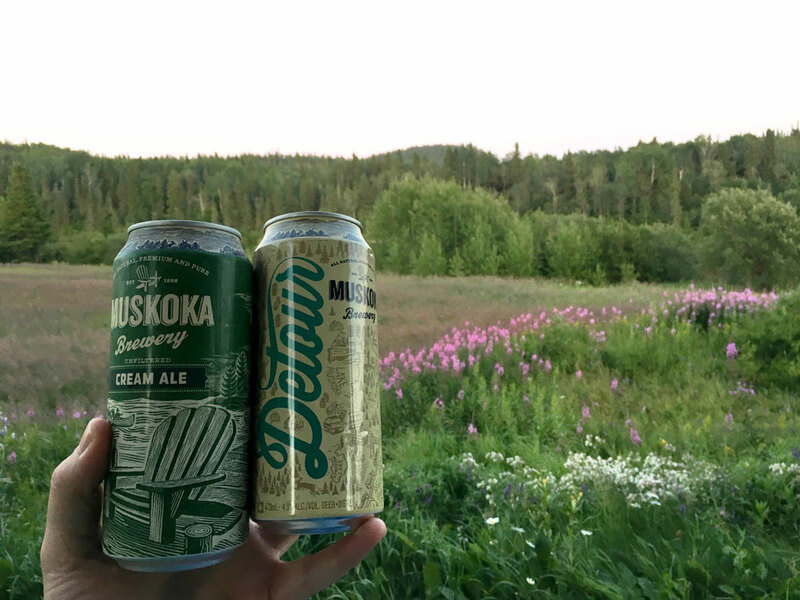 We sat on the back porch swing with our Muskoka beer and watched the sky go dark over the peaceful Pic River. We awoke to a stunning view of the river steaming beyond the back yard. Even in the middle of summer it gets chilly at night this far north. Pukaskwa National Park (pronounced PUCK-uh-saw) was our main attraction in this region. Parks Canada, the world’s oldest organized national park system contains 38 National Parks and eight National Park Reserves which are intended for future parks. Pukaskwa was established in 1978 and protects the longest undeveloped stretch of shoreline in the Great Lakes. Due to the remote location, fewer than 11,000 visitors arrived in 2015, that’s 8,000 fewer than made the difficult trek to Isle Royale National Park. Services are limited, the only developed area is right inside the entrance where the visitor center, campground and trailheads are located. The 60 kilometer Coastal Trail is popular with backpackers as a multi-day camping trip and is probably the park’s signature attraction. Being there just for the day, our plan was to hike the first segment of the coastal trail as far as the White River, a trip totaling 16 kilometers. 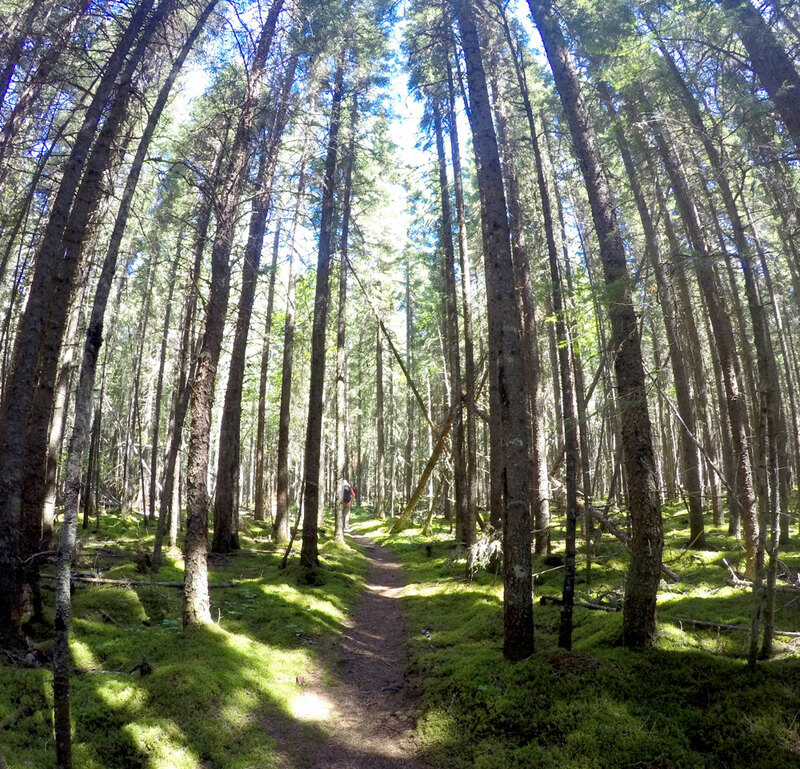 Beginning at the visitor center, the trail heads through the forest alongside Hattie Cove. The start is fairly level, with some sections of trail on planks to protect from mud. A couple kilometers in, the trees open up and the trail crosses a large wetland on a long boardwalk. At the far side of the wetland, the trail re-enters forest and passes through some rocky sections. The last couple kilometers before the White River pass through a pine forest carpeted in fluorescent green moss. At kilometer 8 the trail crosses the river in spectacular fashion on a 30-meter-long metal suspension bridge hanging 23 meters above a set of rapids. The views are amazing and the swaying bridge is an adventure. We spent a while crossing back and forth looking for the best photo opportunities before settling on the landing to eat our packed lunches. The solitude here rivaled that of Isle Royale. We only passed two hikers on the outbound trip and met a group of four while eating lunch. On the way back, we passed two hikers, one dog and a porcupine who didn’t want anything to do with us and waddled away in a minor panic. After buying a couple souvenirs at the visitor center, we hit the road to complete the Canadian segment of Lake Superior. 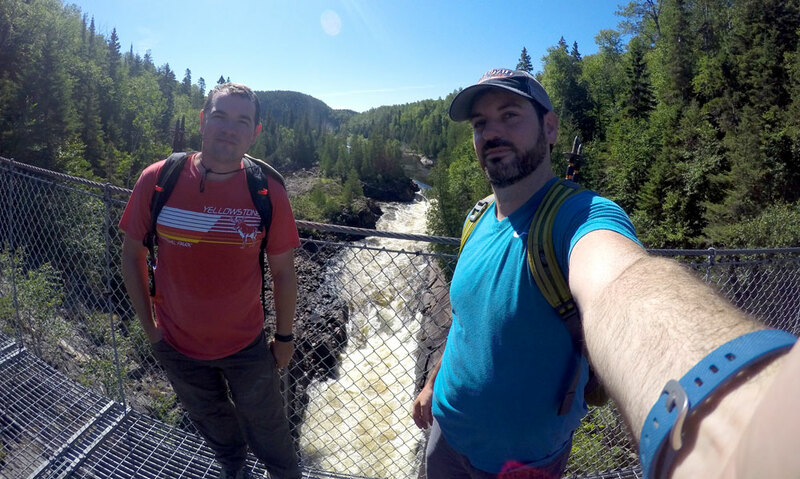 Selfie on the Pukaskwa White River suspension bridge. The four and a half hours to Sault Ste. Marie provided more unexpectedly beautiful scenery, with countless small lakes nestled in the hills and imposing bluffs plunging down to the Superior shore. A significant portion of the drive was through Lake Superior Provincial Park, another large preserve that would be worth an extended stay on its own. 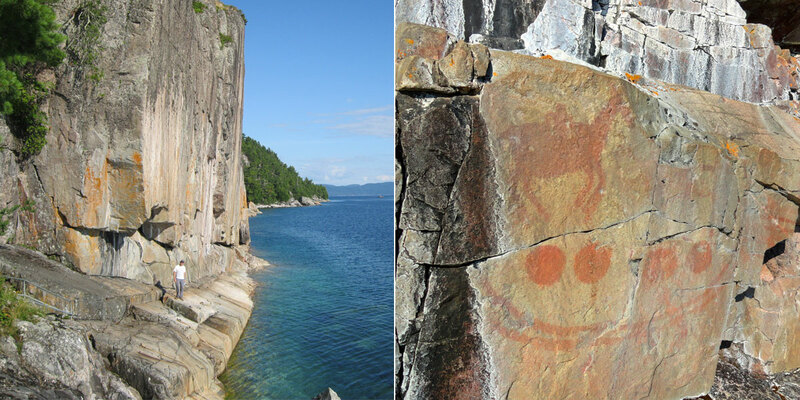 With limited time, we pulled off the highway just once at Agawa Rock to see the famous native petroglyphs. A 0.5 kilometer trail leads to them by way of volcanic rock formations while interpretive signs explain the geologic forces that contributed to the area’s unique appearance. Agawa Rock itself is a 30 meter high granite cliff at the shore. A small ledge at the base allows visitors to view the 150-400 year-old petroglyphs up close as long as the lake is calm. 35 rust-colored images represent historical events and mythical creatures from local Ojibwe culture. Stepping out along the ledge put us face to face with history and left us even more connected to the big lake. Agawa Rock viewing area (L) and close-up view of the petroglyphs (R). Our final night in Canada was spent in Sault Ste. Marie at the eastern limit of Lake Superior. The St Mary’s River separates it from its identically-named American counterpart in Upper Michigan. The evening consisted of delicious pizza at Solo Trattoria and a restful night at the Quattro Hotel. In the morning we visited the Sault Ste. Marie Canal, a National Historic Site of Canada which contained the largest and first electrically operated lock in the world at its completion in 1895. Looming over the site was the Sault Ste. Marie International Bridge, which would soon carry us back into the U S of A. 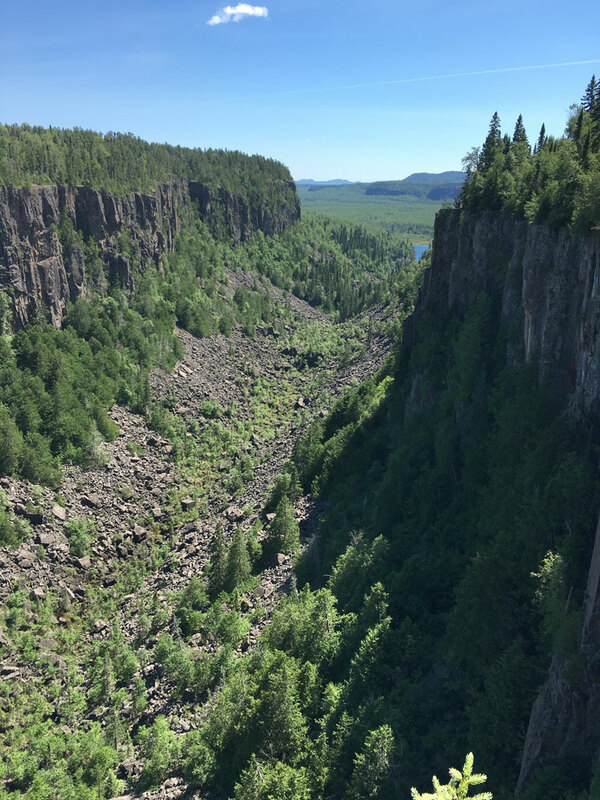 This entry was posted in Destinations, Travelogues and tagged Agawa Rock, Canada road trip, kakabeka falls, Lake Superior Circle Tour, Nipigon Bridge, Ontario Road Trip, ouimet canyon, Pic River, Pukaskwa National Park, Thunder Bay, Valhalla Inn. Bookmark the permalink.